In the second half of 2015, our investment strategy remains focused on the long term and opportunistic in the near term. 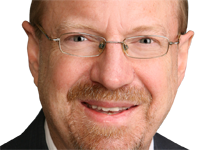 EPA’s Crackdown on CO2 Emissions: An Indecent Proposal? The Environmental Protection Agency's (EPA) proposed rules on carbon dioxide (CO2) emissions create dange and opportunities for investors in utility stocks. Energen Corp (NYSE: EGN) will sell its Alabama gas distribution utility to Laclede Gas (NYSE: LG), for $1.28 billion in cash plus $320 million in assumed debt. The company will deploy the estimated $1.1 billion in after tax proceeds to further develop its high potential properties in the Permian Basin. 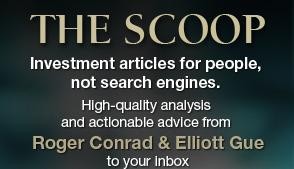 Thanks again to everyone who tuned in to my second on-line chat for Conrad’s Utility Investor subscribers last week. The full transcript of the 4-hour question and answer session is now available on the CUI website by clicking on the “Events” tab from the home page. The massive loss T-Mobile USA (NSDQ: TMUS) reported this week hasn’t slowed the hyperactive tweeting of its CEO John Legere. Nor apparently has the news scared off his groupies on Wall Street, though that may have more to do with continuing takeover speculation. As goes January, so goes the year. That old Wall Street adage doesn’t bode well for most of the stock market. Seek stocks of healthy and growing companies whose prospects exceed investor expectations. Then build a diversified and balanced mix you can hold long-term, to enjoy the rising cash flow and share price appreciation that growing dividends provide over time. 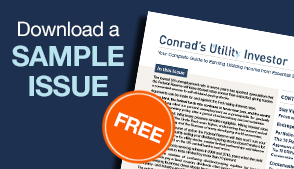 The Conrad’s Utility Investor Portfolios officially launched on July 31, 2013. Since that time, the Dow Jones Utility Average is off -2.3 percent, including dividends paid. My Aggressive Income Portfolio is up by 9.3 percent, while the Conservative Income Portfolio has returned 3.3 percent.